A B.C. Supreme Court justice has convicted a senior member of the Hells Angels of conspiring to import and traffic cocaine following an elaborate RCMP sting operation. David Giles was one of five men on trial in Vancouver in connection with a 2012 undercover operation which saw investigators posing as organized criminals in meetings from Vancouver to Panama City. According to a decision written by Justice Carol Ross, Giles told officers he thought were with a South American drug cartel that he was broke after fighting previous charges and trying to get back on his feet. After many meetings in restaurants and hotels, the Kelowna man and an unindicted co-conspirator delivered $4 million in exchange for what they believed would be 500 kilograms of cocaine. 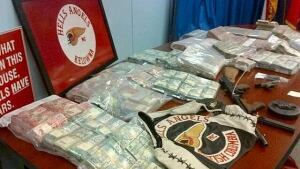 RCMP showed off money and Hells Angels paraphernalia seized as part of the 2012 sting operation which resulted in the arrest of David Giles. But when the deal went down, Giles' men found themselves holding 199 kilos of fake cocaine and one kilo containing real cocaine and a tracking device. The drugs were placed in duffle bags inside a Martha Stewart box. Two other men were acquitted of conspiracy to import and conspiracy to traffic cocaine, including full patch Hells Angel Bryan Oldham. Oldham was found guilty of possession of cocaine for the purpose of trafficking. According to the ruling, Oldham showed off a Hells Angel tattoo at one of the meetings with an undercover officer, as a means of proving that he was a member of the biker gang. Why was the money so wet? The lengthy court decision provides some interesting insights into the worlds of both drug trafficking and biker gangs. Giles unwittingly gave the officers information relating to criminal activities of Hells Angels members. He claimed that side businesses had to be brought to "three people in his room." The undercover officers asked Giles to introduce them to other members of the gang who could vouch for him. But that proved to be difficult. "Mr. Giles said he had had three very long meetings and approached a number of brothers to bring them to the table. They were not comfortable coming to the table, because of Canadian laws concerning conspiracy and organized crime," the ruling says. "None of them wanted to meet the (undercover agents) because they did not know who they were. He said if he brought brothers to the table and something went wrong, it would be a conspiracy and they have learned their lesson." At another point, one of the accused claimed his father had a friend who was "high up" in the "Osoyoos border "and could provide information for northbound assistance crossing into Canada." Another biker gang member said "he had a system to disappear in the United States. He would cross the border and disappear. He would secure a fake ID through a lawyer connection who was an old family friend." Even the logistics of the deal turned out to be complicated, as Giles delivered $2 million in very damp bills. An undercover officer asked why the money was so wet. "Mr. Giles laughed and said that all the money was buried," the decision says. "A lid had broken, and rain got the money wet." Giles was acquitted in 2008 of possession of cocaine for the purpose of trafficking related to another major RCMP operation. Giles and the others who were found guilty will be sentenced at a later date.